Barry Blankers passed away peacefully on Tuesday, April 2, 2019 surrounded by his loving wife and family. With steady purpose and conviction, he preached the word of God for 58 years. Serving in churches throughout the US and the Philippine islands, Barry went wherever God called him. Barry was born April 28, 1936 in Bellingham, Washington to Ernest and Hilda Blankers. He married Clarice Kredit on August 6, 1958. Barry graduated from Calvin College and Seminary with a Bachelor of Divinity. He pastored congregations in Iowa, the Philippines, New Jersey, California, and finally in Lynden. Barry never retired and continued to preach and minister until God called him home. Barry is survived by his devoted wife Clarice, children Terry, Ann, Bruce & Sheryl, Joel & Ginny, Mark & Denise; and grandchildren Michael, Alex, Matthew, Clayton, Daniel, Ellen, Jonathan, Maggee, Max, Kyle and Tyler. 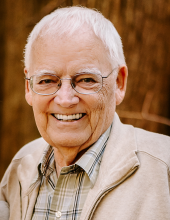 He will be greatly missed by his brother Arvin Blankers, and sisters Sally Bouman and Sheila Bolkema, along with his church family and numerous friends. You are invited for visitation and viewing on Friday, April 5, 2019 at Gillies Funeral Home from 5 to 7 p.m. Please join the family for the graveside committal on Saturday, April 6 at 1 p.m. in Monumenta Cemetery followed by a 2 p.m. memorial service at First Christian Reformed Church in Lynden. In lieu of flowers, the family suggests memorials be sent to PeaceHealth St. Joseph’s Cancer Center Patient Experience Fund (3301 Squalicum Pkwy, Bellingham WA 98225) and Whatcom Hospice (2800 Douglas Ave, Bellingham WA, 98225). You may also share your memories and condolences in the online guest book at www.gilliesfuneralhome.com. To send flowers or a remembrance gift to the family of Barry Blankers, please visit our Tribute Store. "Email Address" would like to share the life celebration of Barry Blankers. Click on the "link" to go to share a favorite memory or leave a condolence message for the family.